I am taking warfarin because I have a mechanical heart valve. I therefore have to be careful about taking any supplements or changing my diet too drastically (eg eating more green veg can hamper the way the warfarin works because of the vitamin K in them). However, last year, because of the heart infection which led my having to have a new heart valve I spent 13 weeks on very strong antibiotics. I am therefore very keen to improve my gut microbes. I already tend to do intermittent fasting by leaving a long period of not eating overnight. 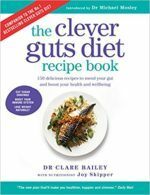 I do not intend to follow the diets as shown in the book as this would be too radical for me but rather to introduce things one at a time e.g. starting with taking apple cider vinegar on my salad. Does anyone have any further advice (apart, obviously from speaking to my GP / practice nurse). GP’s and practice nurses are medical generalists, not lifestyle healthcare or drug specialists. Instead consider discussing diet modification/ supplements/ drug interactions with a registered dietician, cardiovascular specialist, young-ish pharmacist or lifestyle health professional. These are more likely to be familiar with current research. How radical you need to be for results depends where your diet and gut health are now. Mainstream medicine advocates portion control, wide variety, healthy fats, Mediterranean style diet anyway. On the Clever Guts diet what we cut out is arguably more important than what we add in. This is to stop feeding the ‘bad’ microbes and to stop aggravating the gut. Although, say, dropping gluten and refined grains sounds drastic, this largely translates to cutting out highly processed wheat products. So biscuits/ cookies/ cakes/ many breakfast cereals/ bought sandwiches/ ‘plastic’ bread/ TV dinners. Since these are loaded with additives (sugar/ sweeteners/ flavour enhancers/ salt/ unhealthy fats) and low in fibre, we should already be minimising them to fit in with official healthy eating guidelines. We can still have oats, brown rice, other gluten-free grains, root vegetables for a wide variety of starches. Plus beans and lentils if they don’t cause you problems. Preparing meals from scratch makes it so much easier to make simple swaps and increase variety. I won’t be baking my own bread – laziness and broken oven – but rather adjusting my recipes for stir fries, curries, soups, mega salads and dairy or egg-based breakfasts.